Nothing has changed late 20th century tourism in Salzburg as much as the release of the movie "The Sound of Music" in 1965. 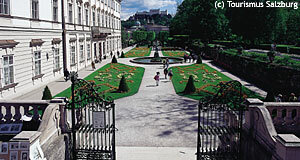 The film was shot in Salzburg and its surroundings, and became an instant success, following the original stage musical. Since then, "The Sound of Music" has become a reliable source of income for Salzburg′s tourism mafia. In Salzburg, you can attend the "Sound of Music Dinner Show", do various kinds of "Sound of Music Tours" by bus, bicycle or mp3-audio-guide - or go to "Sound of Music Singalongs". In early summer of 2008, plans were announced to even transform the original Trapp Villa into a small, luxury hotel. In short: "The Sound of Music" is big business in Salzburg. Most of the sites where the movie was filmed can be visited by walking or public means of transport. This applies also to the towns of the Salzkammergut Lake District - for details, see our articles in the "surroundings" section. On this page, we had collected a few videos with clips from "The Sound of Music" or impressions from the original filming locations in Salzburg. An appetizer for your trip to the city and its surroundings. Unfortunately, we decided to remove most clips in 2009 because we realised that they infringed copyrights - they had beed uploaded by private individuals. Individual songs, however, can always be found on YouTube. Just look at our Sound of Music Songlist for ideas. Note: We decided to remove clips of the actual movie as we realised that it was copyright material even though it remains on YouTube, apparently without resistance from the copyright holder.